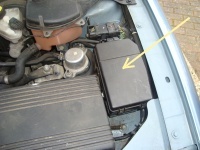 The Engine bay fuse box is locate adjacent the battery. There is a clip at the rear press this in and firmly pull up. It is difficult to remove the lid, and normally you can access the fuses without taking it off completely. 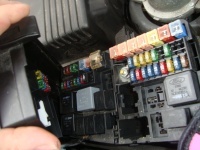 You will find spare fuses and a fuse removal tool clipped in the lid of the fuse box. Fuse Location for Engine bay fuse box . F1 Cartridge 20 Blue Dip beam, High Intensity Discharge (HID) light relay. F2 Cartridge 50 Red Ignition relay feed. F3 Cartridge 60 Yellow ABS. F4 Cartridge 30 Pink Rear window heater/heated mirrors relay. F5 Cartridge 30 Pink Automatic transmission control module relay. F6 Cartridge 30 Pink Heater blower relay. F7 Cartridge 50 Red Power supply to passenger compartment fuse box. F8 Cartridge 80 Black Blower module. F9 Cartridge 50 Red Engine management system power relay. F10 Cartridge 20 Blue Headlight power wash pump relay. F13 Mini 30 Green Heated front screen right-hand side. F15 Mini 30 Green Heated front screen left-hand side. F16 Mini 20 Yellow Left-hand dip beam, day time running lights, autolights. F17 Mini 20 Yellow Right-hand dip beam, HID lights. F18 Mini 20 Yellow Throttle motor supply. F19 Mini 15 Blue Screenwash pump, rain sensing system. F20 Mini 5 Tan Navigation display. F21 Mini 15 Blue Side (Parking) lights. F22 Mini 20 Yellow Accessories relay. F23 Mini 10 Red Air conditioning compressor clutch. F24 Mini 15 Blue Door lock power. F26 Mini 15 Blue Horns. F27 Mini 10 Red Automatic transmission control module, transit relay. F28 Mini 15 Blue Ignition switch . F29 Mini 30 Green Starter motor solenoid. F30 Mini 30 Green Accessory sockets. F31 Mini 10 Red Engine management relay coil. F32 Mini 5 Tan Engine management control. F34 Diode D3 Not used. F35 Diode D2 Engine management control relay diode. F36 Mini 10 Red Canister purge valve, airflow meter, throttle motor relay, power wash relay, air conditioning relay. F37 Mini 15 Blue Engine management system, blower speed controller, road speed sensor (if fitted). F38 Mini 30 Green Oxygen sensor heaters A.
F39 Mini 5 Tan Variable intake valves. F41 Mini 10 Red Injectors.